Arunachal Pradesh fashion designer Tonu Riba has been roped to design the national costume for Mrs India Universe Smita Deb. She will be representing India at the prestigious Mrs Universe 2018 pageant scheduled to be held in Philippines on December 12. She also became the first fashion designer from the state to design a costume for India at an international pageant. Hailing from a small town Libakali in Lower Siang district, she carved a name for herself at various fashion events across the country. She represented Arunachal Pradesh in the North East Fashion Fest Delhi, North East Fashion Fest Guwahati, Vivel North East India Fashion Week, Mega Miss Northeast and several other events. The fashion designer also designed costumes for popular Assamese music video Jilele Jilele, reports Arunachal Times. Riba is mainly noted for her designs of the state’s traditional tribal headgears, tribal dresses in a modern way and her creations of fusion designs won her accolades at leading fashion events. Riba said that she has been working hard to create the best costume for Deb and that she is lucky to be assigned as a designer for a prestigious international event. Meanwhile, Liromoba MLA Nyamar Karbak and Likabali MLA Kardo Nyigyor have extended their support and best wishes to Riba. 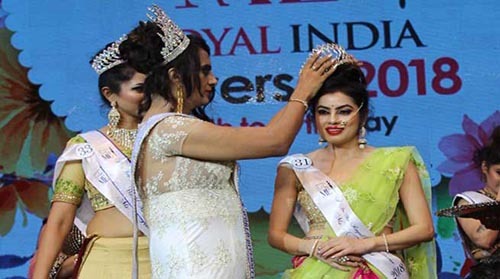 Deb who won the Mrs India Universe 2018 title is a resident of Silchar and owner and founder at Styling City Unisex Studio at Silchar, a Phd scholar at Assam University and Assistant Prof and Joint Co-ordinator in the Dept of Journalism at Science College, Kokrajhar.